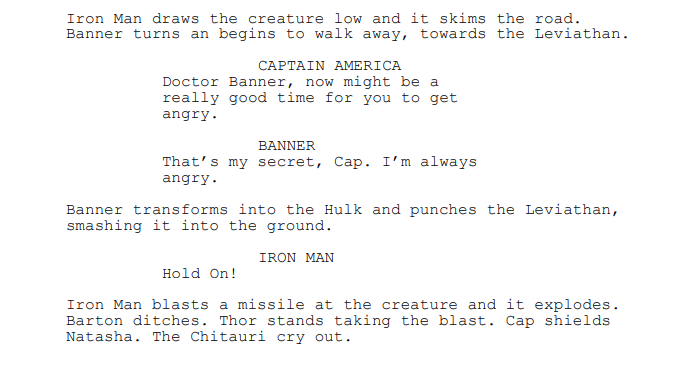 There are so many scenes in our favorite Avengers movies that stand out to us. Some are light-hearted and some are intense, but it’s the thought provoking ones that capture me. One such scene is from The Avengers, the first collective film, where Bruce calls upon Hulk. It goes without saying that this is spoiler territory and while the film is encroaching upon being a decade old, I won’t be holding back on speaking on the series as a whole or what these characters witness then and in the future. 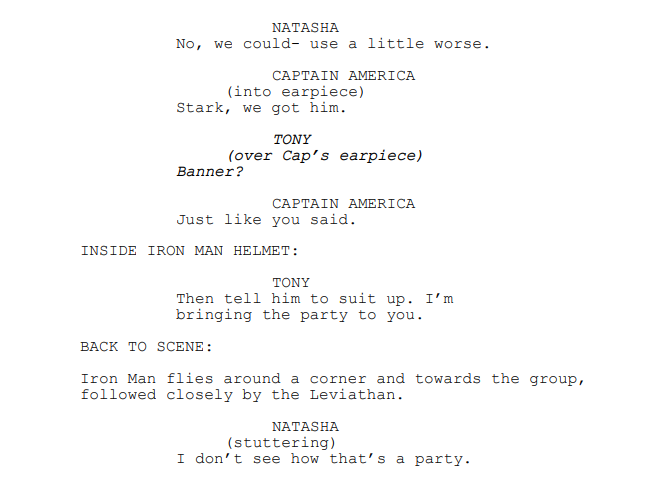 If you’ve not scene the Avengers films, this ain’t the piece for you and that’s cool. There, you’ve had your warning. Where we begin is at the major battle for New York, which becomes a persistent trauma that, not only do the people of the city have to live with, but so do our heroes. This scene takes place over halfway through the film, having already drawn on gathering the team of unlikely folks together. We had to watch Captain America and Iron Man duke it out, we see Thor show up with little to nobody having any idea what to make of him and Black Widow seeking out Bruce Banner to finish up the team. It’s this congregation that opens up The Avengers from their series of singular movies into a full-fledged team. There were some trickling effects though, and we’ll dive into that. Let’s start from the top. The chips are down, in this moment, as everyone feels scattered in what is their first real battle together as a group. Nobody truly knows one another but they’re assumed to be working as a unit and the cohesion isn’t quite there just yet. In the beginning, it almost feels like Nick Fury has Hawkeye and Black Widow compiling a group but with their limited power set, they had to be take-charge and professional whereas their ‘super‘ compatriots aren’t really doing so. Everyone wants to be the guy. 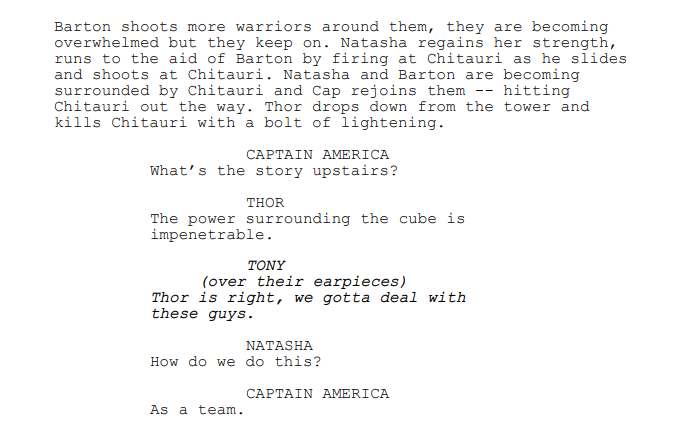 Cap, in a moment of attempting to take lead, reminds them that they need to push forward as a team and not just everyone on their own. It’s complicated, but ultimately more realistic, right? Would you immediately trust the people you were hoisted up into a team with when it seems purely based on powers and not necessarily about the end-goal? In these moments, we see that everyone seems to have baggage and it’s complicating their unity. Thor wants to take down his wild brother, Loki, and to hell with New York as he has seen war and destruction on many a planet before. Cap wants to save the world and sees it as a pure black and white scenario, wanting everyone to fall in line with his finger-wagging. These are superheroes though, how do you police them? Who watches the Watchmen? Sorry, wrong franchise. Then, as if feeling the fragmentation in his very soul, Bruce Banner shows up to greet Natasha. Banner, of all of them, receives the most judgment from the team at large. Not only did he not ask for this to happen to him and take on a crazed being that he controls within mere threads, but he’s seen as less heroic because he doesn’t want war. The rest of them are almost hungry to fight, but not Bruce. He is approached almost as if he’s wanted for the Hulk but less for the brilliant scientist and genius mind that he also possesses. Within those moments of him being on the team, one can almost see a pity come from them towards him. Can they rely on someone who didn’t sign up to be a hero? Black Widow and Hawkeye signed on for this, despite not having the flair and confidence of super powers that Thor and Captain have. Tony is Tony and his genius built a suit that can withstand and dish out so much, but Bruce? Bruce was just trying to hide and stay calm. Is he even capable? They start to run out of options, however. Thor is going rogue, Cap can’t seem to wrangle everyone and Tony is zooming around attempting to do his best from the skies. Thankfully, Tony has a plan and it’s a long-shot based on what they know of the somewhat meek Bruce Banner, but it’s time to cross their fingers and pray that Banner can control some of this and help bring the fight to a level playing field. Where does his mild-mannered place come from though? 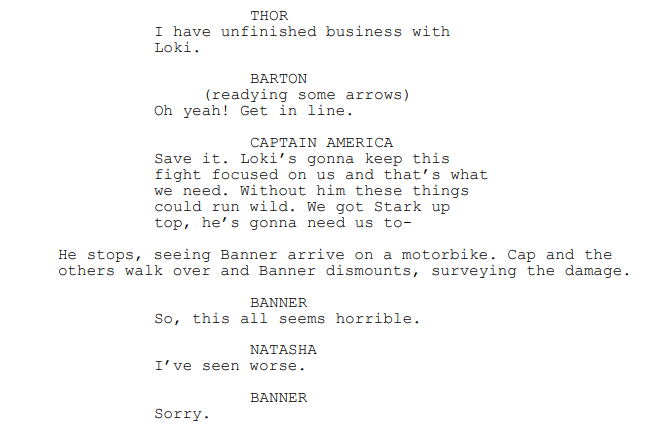 Even in the beginning moments of meeting Natasha (Black Widow), he feared he was being approached in order to be put down. He fears the monster inside and lives in a lack of confidence that he can understand it, control it and ultimately protect himself from Hulk. I can’t even imagine what living with that, especially in the beginning, had to feel like. To have that concentration of brilliance in your mind and yet you can’t grip this concept? See, Bruce also tried to test Natasha when they met because everyone says they can handle your ‘ugly‘ and your ‘big bad‘ and that rage you may tell people you contain. They roll their eyes and they think you’re just being moody and edgy, but what if you knew they’d never seen something quite like you? Banner startles Natasha, roaring in her face to make her knee-jerk pull her gun on him and soldiers move in ready to protect her. He ultimately checks her on this, but that is the extent we see of his fury in a calculating way. His mind is a battlefield and yet, the team hasn’t seen it come to a complete nuclear head that the team can control, let alone work alongside. It’s as Banner utters these words and speaks to the pain a lot of us feel, to obviously different degrees, but that we have to house rather than let explode. There are so few people that this scene didn’t resonate in some way with, because we’ve all been there. We live such homogenized lives but when we have to bring our Hulk out, we know it’s time to let loose and it’s up to every individual person when they can unleash and to what level it’s appropriate. Here, Banner finally shows his control over Hulk in these early times and ultimately acts as the glue that brings this team together. Not just working solo, bringing their talents along but using them to help one another through the same goal. This is why this team works — because every part fits. The harrowing tale of a man who has a monster living rent-free within his body, terrified of his anger but knowing it is ever-present, is the most we truly get to identify with when it comes to this team. We’ll never be Cap. Most of us will never see a Tony Stark life. Hell, who can identify with Thor who doesn’t have major ego issues? But Hulk? Bruce? We’ve all been there to some degree and while our beasts never manifest from our bodies, we know what it’s like to stifle it out of fear of hurting those around us. We feel empowered, just as Banner does, because he is aiding the people around him, the people of New York as well as his fellow Avengers, and utilizing his pain towards heroism. We want that for ourselves, don’t we? To take the worst parts of ourselves and find a way to make them do good? When we cheer on Bruce and his “roommate“, Hulk, we are cheering on the idea that there is hope that we don’t have to conceal our pain and hide it away. We can harness it in ways that can save our friends, save others, but mostly — save ourselves. Next article Video Vault: Thor and Hulk Get Cute in Thor: Ragnarok Bloopers! Previous article Friday Five: Great Showdowns That Don't Involve Fighting!